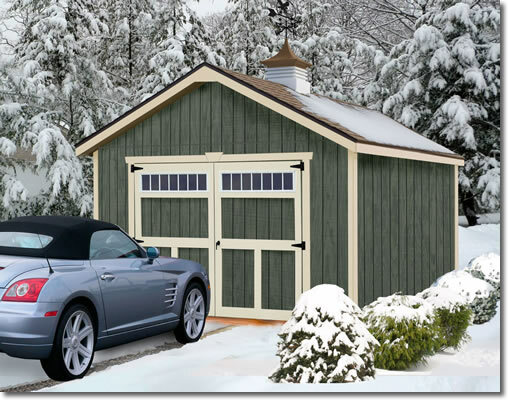 If you're looking for a single car garage with the beautiful style of carriage house doors consider the Dover 12ft. wide garage kit from Best Barns. 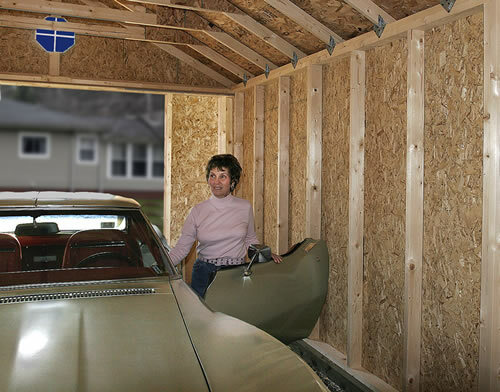 Perfect for your car, suv or truck this garage can offer additional space for tools and storage. Available in 16ft., 20ft. and 24ft. lengths you can choose the size that best fits your needs. 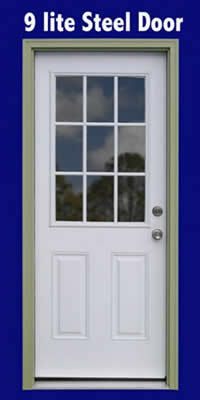 Featuring carriage house style doors that swing outward and provide light through large transom windows. The door opening is 8ft. Wide x 7ft. High. Add additional items like a walk-in door or windows with shutters to build as you like. Constructed of premium 2x4 framing spaced 24in. o.c. 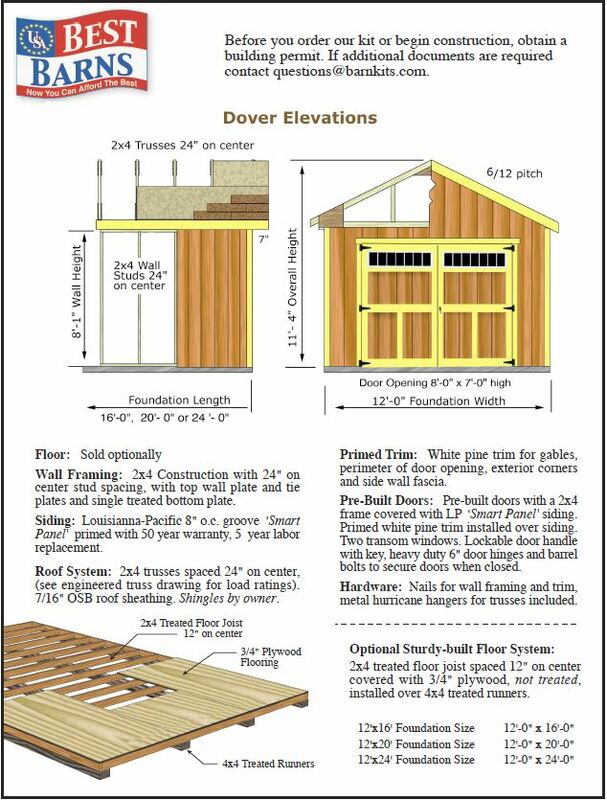 the Dover garage includes pressure treated bottom wall plates if you choose to build on a cement pad. 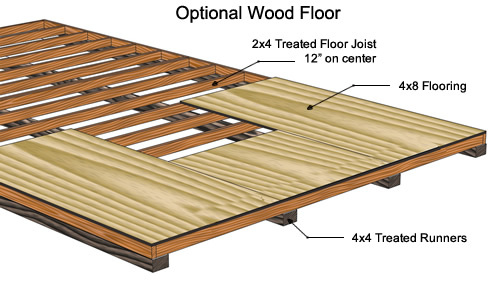 Or, you may order an optional sturdy-built wood floor. Finish your new garage by purchasing shingles or a metal roof and painting the color of your choice. * building is shown with optional cupola. All required hardware including door hinges, latch, nails, hurricane hangers, glue for gussets and detailed instruction manual. Shingles, roof edge and paint purchased separately. Order with confidence. We take great pride in our wood shed kits. Product quality and satisfaction is out number one goal. We use the highest grade of lumber available. 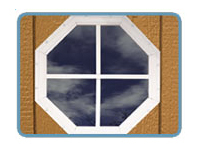 Optional single hung windows with screens & decorative raised panel shutters. 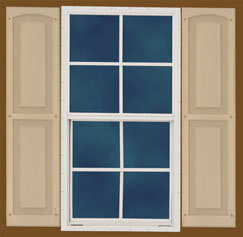 Single hung windows 18" x 36" aluminum windows provide light and ventilation. Lockable frames are durable and easy to operate. Screens limit birds and insects. Decorative raised panel shutters are included. Our trusses are engineered to handle severe snow load of 40 psf (pounds per square foot) and 130 mph wind loads. 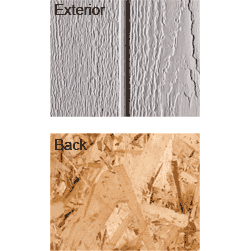 Choose an optional Sturdy-Built wood floor for your new garage kit. Easy to construct and designed specifically for your building. 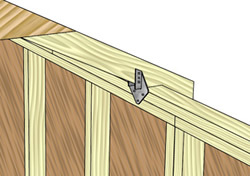 The Sturdy-Build floor system comes standard with 3/4" plywood flooring and 2x4 treated floor joists spaced 12" o.c.. Floor is supported with 4x4 treated runners. The Dover garage kit has plenty of headroom and interior space for your car. Wall height is 8ft. 1in. Below is information that your local permiting office may need prior to construction. Please check with the permit office before purchasing.